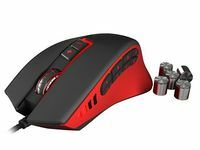 Natec Genesis GX85 is a professional mouse designed for gamers who know how to win. It is distinguished by precise laser sensor and up to 13 programmable buttons for total control over the gameplay. GX85 has been created for MMO gamers. It has 13 programmable keys and advanced software that will allow to adjust your own style and create many macros. The whole is complemented by the ability to change DPI sensitivity ON-THE-FLY in six levels. The result of this is that the mouse is perfect solution for avid player of games WOW, LOL and other games from the rich world of MMO. One of the key traits of mice is laser sensor Avago 9800 with maximum resolution of 8200 DPI, which provide great precision, so much desired in gaming. In addition, the sensor offers the report rate from 125 to 1000 Hz, which ensures the fast response time and uninterrupted gameplay. Advanced software also allows to set sensitivity of sensor from 250 to 8200 DPI in increments of 50 DPI and thanks to Precision Aim Function which allows to perform actions requiring high precision. Holding down the button with assigned of this function decreases the sensitivity of mice to level 500 DPI, after releasing the button sensitivity returns to the previous setting. 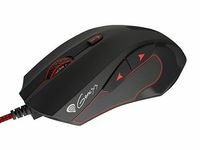 Unique shape of the mouse Genesis GX85 is designed for players who use the handle of mouse PALM GRIP. 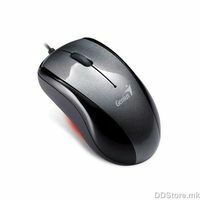 It is distinguished by ergonomic shape, which ensures that even several hours of using the mouse will be still comfortable and pleasured. An interesting solution is DPI level indicator on the left side of the mouse, which makes checking of DPI level much easier.